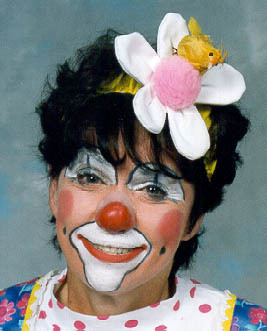 Carole Johnson specializes in Caring Clowning. She makes weekly rounds of the outpatient clinics of Children's Hospital and Regional Medical Center (Seattle, WA). She also clowns at area nursing homes, and the Ronald McDonald House. Carole considers Caring Clowning one of the most difficult specialties because you have to be prepared to meet many different needs, not just of the patients and nursing home residents, but also visitors, employees, and staff. She says the key to Caring Clowning is sensitivity. Carole utilizes magic, puppetry, and sight gags in her visits. She excels in improvised one-on-one interactions. In appearances at nursing homes and charity events, Carole also creates balloon sculptures. She has often been seen in December as Mrs. Claus. Carole is a popular instructor. The places she has taught includes the University of Wisconsin Clown Camp, World Clowns Association Convention, Clowns International Festival (Bolton, England), Northwest Festival of Clowns, and the Clown Ministry IMPACT Conference.